The 2015/2016 CLSANA bi-annual meeting will be held at the Universiteit van Amsterdam﻿, May 27-28, 2016. All are welcome to attend. Registration is required for all Annual Meeting attendees,﻿ through clsana2000@gmail.com. We will be announcing the call for papers for the next bi-annual meeting in the next few months. Prominent Chinese human rights lawyer Pu Zhiqiang has been released from detention after receiving a suspended jail sentence.Mr Pu was found guilty by a Beijing court earlier on Tuesday for "inciting ethnic hatred" and "picking quarrels" in social media posts.The court sentenced him to three years in prison but also said the sentence would be suspended.He is the latest to be tried in a crackdown on dissidents in China.Mr Pu was released from Beijing's Number One Detention Centre on Tuesday afternoon, where he had been held for 19 months.He is now under "residential surveillance", and has 10 days to decide whether to appeal against his conviction and sentence, his lawyer says. Experts say the suspended sentence means Mr Pu can avoid serving time in jail - but could be monitored during the suspension period. The guilty verdict means he can no longer practise law.﻿Mr Pu could have faced a maximum sentence of eight years in prison. China passed the biggest changes to its environmental protection laws in 25 years, outlining plans to punish polluters more severely as leaders work to limit contaminated water, air and soil linked to economic growth. The amended law “sets environmental protection as the country’s basic policy,” according to a copy posted on the government’s website. 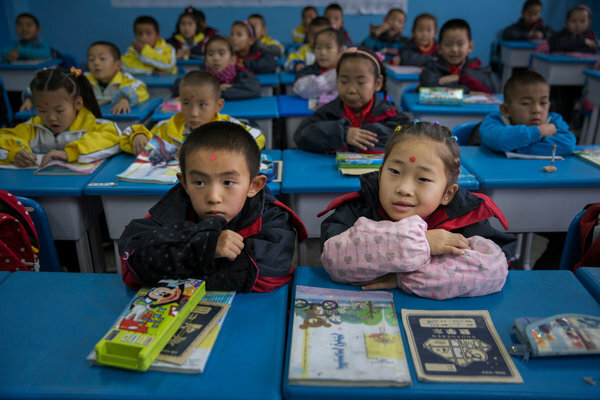 The rules hadn’t been changed since first enacted in 1989 as China began consuming more energy and the world’s most-populous country transformed into a global manufacturing hub. Now the world’s biggest carbon emitter, China has moved to address the environmental damage that has been a byproduct of its breakneck economic growth and become a leading cause of social unrest. Government reports and recent comments from top officials about pollution have revealed the extent of the damage and raised new concern about its health effects. The changes provide “a strong incentive for polluters to come into compliance” as violators can be fined on a daily basis, Finamore said. The amendments become effective from Jan. 1, according to the revised law, which was passed on yesterday by the Standing Committee of National People’s Congress, China’s top legislature. It allows for consecutive daily fines on polluters if they don’t get better and offers channels for whistle-blowers to make environment-related appeals. Non-government groups can also file lawsuits for environmental damage under certain conditions, it says. While China is currently the top global investor in clean energy, it will still be reliant on coal for most of its electricity in 2030 -- by when its power needs will have more than doubled, according to a report by Bloomberg New Energy Finance.One major reason for the worsening environment has been the political weakness of the Ministry of Environmental protection, Dai Qing, a Beijing-based environmental campaigner, said in a telephone interview.“If Premier Li Keqiang was head of a environment ministry small group or President Xi Jinping himself then I would have some hope,” she said.New measures such as heavier fines, naming and shaming of companies and the demotion, dismissal or criminal prosecution of local government officials who don’t enforce regulation or manipulate data are expected to be more effective, the official Xinhua News Agency said yesterday. Feb. 24 (Bloomberg) -- Michael Jordan, the hall-of-fame basketball player who heads his own division at the world’s largest sporting-goods maker Nike Inc., sued a Chinese maker of sportswear and shoes for unauthorized use of his name. Jordan, who won six National Basketball Association championships with the Chicago Bulls, filed the lawsuit with a Chinese court against Qiaodan Sports Co., according to a statement distributed by PR Newswire. The Chinese company, which is preparing to raise 1.06 billion yuan ($168 million) in a listing in Shanghai, is accused of using Jordan’s Chinese name and jersey number 23 without permission. NBA games shown on state broadcaster China Central Television and Chinese players including Yao Ming have helped make basketball the nation’s second-most popular sport. Nike, which counts Jordan and current NBA stars Kobe Bryant and Lebron James among its endorsers, said its sales in China for the quarter ended Nov. 30 rose 28 percent from a year earlier to $650 million when excluding currency changes. The company’s name and its trademark are the same as the Chinese version of Jordan’s name. The Chinese company, with registered capital of 450 million yuan and based in Southern China’s Fujian province, won approval from the nation’s securities regulator in November for an initial public offering of 112.5 million shares. In its IPO prospectus released on Nov. 21, Qiaodan said investors should be aware of potential trademark risks, saying some consumers may link the company and its products to Jordan due to confusion, though it claimed to have no commercial relationships with the former NBA star and has never used his image in promotions. Jordan hadn’t raised any complaints against Qiaodan regarding the trademark since the company was established in 2000, according to the prospectus posted on the website of the China Securities Regulatory Commission. “‘Qiaodan’ is a brand we registered according to Chinese law, and its lawful use should be protected,” Qiaodan said in a statement posted on its website yesterday. “We will make further clarification through our website if there’s any development.” The company said it hadn’t received any court notice as of noon yesterday. Qiaodan has opened 5,715 retail outlets in all 31 of China’s provinces and municipalities, according to the prospectus. In 2011, the company signed Chuck Hayes, currently a member of the NBA’s Sacramento Kings, to a sponsorship agreement, according to the prospectus. The Chinese police chief rumoured to have attempted defection amid political intrigue visited a US consulate this week, Washington has confirmed. Political observers and internet users have been gripped by speculation about Wang Lijun's case since hundreds of police surrounded the building in south-western Chengdu on Tuesday and officials in nearby Chongqing said he was receiving "vacation-style treatment" for stress. Asked about Wang, a top Chinese diplomat said it was an "isolated incident" and had been "resolved quite smoothly", the Associated Press reported. The deputy foreign minister, Cui Tiankai, who was briefing reporters on vice-president Xi Jinping's trip to the US next week, said it would not affect the visit. Wang became known nationally for leading a crackdown on organised crime in Chongqing at the behest of the city's ambitious party secretary, Bo Xilai. The bigger question is how his case may affect Bo's prospects – and more generally the transition of power to a new generation of leaders this year. He was regarded as a key ally of Bo and was appointed vice-mayor in May. But Wang's abrupt transferral to non-police duties last week led to claims that the two men had fallen out. The state department spokeswoman Victoria Nuland told reporters in Washington: "Wang Lijun did request a meeting at the US consulate general in Chengdu earlier this week in his capacity as vice-mayor. The meeting was scheduled, our folks met with him, he did visit the consulate and he later left the consulate of his own volition … Obviously, we don't talk about issues having to do with refugee status, asylum." She added that to her knowledge, the consulate had not been in contact with Wang since then. The Chongqing information office did not answer calls on Thursday. The South China Morning Post (SCMP) cited sources suggesting Wang had been flown to Beijing. There have been claims that investigators from the party's discipline and inspection committee arrived in Chongqing recently. "It seems certain that Wang has got himself into major trouble and once the anti-triad campaign is allowed to be reviewed, it will be a decisive blow to Bo's career," Prof Yuan Weishi, a historian at Guangzhou's Sun Yat-sen University, told the SCMP. Wang, 52, was born into a Mongolian family in northern Liaoning province. He became a traffic police officer in 1984 but rose rapidly through the ranks, earning a reputation as a gang-buster – and, according to Chinese media reports, a 6m yuan price on his head from enraged triads. Observers think the fallout from events in Chongqing could mean a bumpy ride for Bo, who had been tipped to join the Politburo standing committee, and others. That could recast the broader political outlook, potentially to the benefit of liberals alarmed by what they see as Bo's leftist tendencies. While many Chongqing residents welcomed the anti-triad campaign, critics accused it of trampling on the rule of law. It is widely assumed Xi will become general secretary and president of China, with Li Keqiang taking over as president. But in a system of collective leadership, the composition of the full standing committee is crucial and analysts have warned that competition for places is fierce. "The growing openness of self-promotion campaigns by some of these ambitious politicians, their idiosyncratic initiatives and policy interests, and their respective strengths and weaknesses have made this upcoming political succession a particularly challenging one for the [Communist party] leadership," wrote the Brookings Institute analyst Cheng Li in a recent paper. Chinese authorities have indicted veteran dissident Zhu Yufu on subversion charges for writing a poem urging people to gather to defend their freedoms, his lawyer said today. Mr Zhu (60), from the eastern city of Hangzhou, was arrested last April for "inciting subversion of state power", a charge often used against critics of the ruling Communist Party. No trial date has been set, the lawyer, Li Dunyong, said by telephone. "The main reason for the indictment was a poem he had written calling for people to gather. He had written the poem around the same time there was chaos (in the Middle East)," Mr Li said. "He believes in the freedom of expression." Mr Li collected the indictment on Monday from a Hangzhou court and met Mr Zhu, describing him as being "in a good condition". The authorities disclosed the decision to prosecute Mr Zhu nearly a year after he wrote the poem, entitled It's time . A verse reads: "It's time, Chinese people!/ The square belongs to everyone/the feet are yours/it's time to use your feet and take to the square to make a choice". Mr Zhu's lawyer said the poem had been published on the Internet. But Mr Li said that Mr Zhu had nothing to do with online calls for "Jasmine Revolution" rallies inspired by Middle East uprisings. Elsewhere, activist artist Ai Weiwei, whose 81-day detention last year sparked an international outcry, said he was interrogated for five hours on Sunday for throwing stones at and making a rude gesture to surveillance cameras outside his home. Police told Mr Ai that he had to be questioned because he was suspected of "damaging public property", the artist said by telephone. Mr Ai said the stones did not hit the 10 cameras outside his house and he did not think he would face charges. "They said to me: 'This is a warning because you have to behave'," Mr Ai said. "I said: 'I'll behave. I take your warning seriously. But I'm human, I have to show my attitude. It's just a gesture. You're so powerful, how can I destroy you?'" A third dissident, Hu Jia, said he was taken in for questioning today, as has happened several times since police raided his home and took two computers. Hu said police investigators asked about his motives for urging citizens to seek the freedom of detained rights advocates Chen Guangcheng and Gao Zhisheng. "I think they were exploring my views to see what I'm planning to do this year," he said. "They told my wife I could be regularly questioned. I think it's a kind of pressure to ensure my silence." China's foreign ministry defended China's human rights record, rejecting an assessment by US ambassador Gary Locke that the human rights situation was deteriorating. "Such statements are not true," said Foreign Ministry spokesman Liu Weimin told a briefing. "The Chinese side attaches great importance to promoting and protecting the fundamental rights and interests of people of all ethnic groups, including the freedom of expression and of religion." "As for some people who have dealt with the law, it's not because their freedom of expression and freedom of religion have been suppressed," Liu said. "It's because they have violated Chinese laws and regulations and so should be punished by the law. It has nothing to do with so-called human rights." 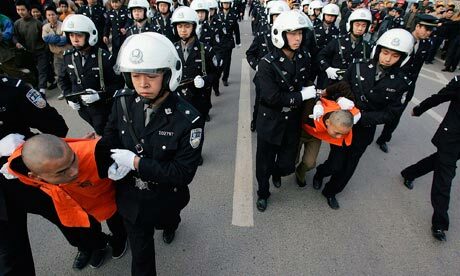 Chinese police will gain new legal powers to detain suspects for up to six months without telling their families where or why they are held, according to a state newspaper's account of planned reforms. Human rights activists and legal scholars warned that the change would legitimise an alarming pattern of detentions under the residential surveillance law, which was initially intended as a less punitive measure than formal detention. Most of those who went missing in a crackdown on activists, dissidents and lawyers this year were taken to secret locations chosen by police. They were held for weeks or even months under residential surveillance. The law does not specify that relatives must be informed, presumably because it was assumed suspects would be held at their homes. In comparison, police must inform relatives within 24 hours of detention and must seek prosecutors' approval for arrest within 30 days. The proposed changes are part of an overhaul of criminal procedure law now being considered by the National People's Congress (NPC), China's legislature. "The proposed 'reform' is designed to legitimise this blatantly unfair, police state practice, while leaving the rest of the criminal procedure law as misleading decoration," said Professor Jerome Cohen, an expert on China at New York University's School of Law. He said he believed police were specifically banned from holding a suspect at an address other than his or her home under binding rules issued in 1996. Cohen added: "This is a perfect illustration of the dangers of revising the law in repressive times. The problem is that the police use each law revision round to legitimise their convenient practices and they ignore in practice the legislative and administrative reforms designed to bind them." The draft text has not been published, but the Legal Daily newspaper reported that police would be able to hold suspects in state security, terrorism or major corruption cases at a "designated residence", if holding them at home would impede the investigation. The decision would need to be approved by higher officials. In state security and terrorism cases the police would not have to notify the suspect's family if they believed it might hinder the investigation – a criterion that scholars say is so vague as to be meaningless. Experts say residential surveillance has been misused in the past. But Dr Flora Sapio, of Turin's Centre of Advanced Studies on Contemporary China, said its use against dissidents was a new phenomenon. Sapio, who has been logging proposed amendments, warned that if the change went ahead it would "entrench the powers of police much more formally" and make it harder to criticise disappearances. Joshua Rosenzweig, an independent human rights researcher in Hong Kong, cautioned that the changes were still at draft stage and might contain restrictions on the use of the measure, but said the change appeared to be "a dangerous legitimisation of a highly suspect practice". Scholars have praised other amendments for improving protections for individuals, at least on paper. Changes include ruling out the use of confessions obtained through torture and granting the right to judicial review for mental health patients who are forcibly detained. Nicholas Bequelin, of Human Rights Watch, added: "If these are indeed the [residential surveillance] provisions, and they are adopted, it seems to be a trade-off for the public security bureau to sign off on the improvements in criminal procedure law. "There is in any case very little restraint on what the police can do in sensitive cases; what's worrying is that this would be a tacit endorsement … It is a very dangerous precedent." No one at the Ministry of Justice or the NPC was available for comment. I've just been reading an interesting article that reports the results of a 2008 study of dispute resolution mechanisms and preferences sponsored by the Supreme People's Court. The investigators distributed 5,518 questionnaires and got back 5,508 effective responses. The distribution covered urban, suburban, and rural areas. No doubt there are many problems with the data; the article doesn't report how the respondents were chosen, and I doubt very much that it was done truly randomly. Such a high response rate, if nothing else, would be quite unusual, I think, among a truly random group of respondents. Anyway, the data are still interesting, even though we shouldn't put more weight on them than they can bear. One interesting feature is the relatively strong preference for courts over other dispute resolution mechanisms. All respondents expressed a strong preference for trying first to work a dispute out bilaterally or with the aid of an intermediary; quite sensible, and no surprises there. As a second choice, urban and suburban respondents clearly preferred courts over other options; rural residents picked mediation via the villagers' committee. There's a common-sense explanation for the villagers' stronger preference for mediation relative to urban and suburban respondents: the village is a more stable community where people know each other, and thus mediation is more coercive (and therefore more effective) than it would be in an urban setting. Anyway, here's a chart I worked up using the data. Click on it for the full-size version. The Supreme People's Court has just promulgated a new judicial interpretation of the Marriage Law. A large part of it is about how to deal with real property upon divorce. By and large the rules seem sensible to me as a matter of economic principles. For example, each party can keep assets that they brought into the marriage, as well as interest on those assets, but (at least as I read the interpretation) accretions to value attributable to the joint efforts of the partners (including one spouse's staying at home to look after the children while the other works to improve the asset's value) are subject to the rules on marital property. Wang Yong, a professor at China University of Politics and Law, is not happy with Article 10 of the interpretation, and denounces it here as harmful to women and destructive of marital trust. Article 10 of the interpretation deals with the following kind of real property: both parties sign the purchase contract before they are married, but one party (usually the husband - call it Party A) makes the initial payment and has the property registered in his name. During the marriage, the mortgage payments are made from marital property. Upon divorce, if the parties do not otherwise agree, the property stays in the name of Party A. That party assumes the remaining debt. The other party (call him or her Party B) gets a share of the value in the form of a debt owed to them by Party A. Let me say first off that it's not completely clear to me that the interpretation calculates correctly the amount Party B should get. Assume for simplicity's sake that both parties contributed equally to the pre-marriage down payment. All post-marriage payments should be deemed to come from marital property, which is presumptively owned in equal shares by the parties. Let's assume that the down payment was 100,000 yuan on a sale price of 1 million yuan, so the couple borrowed 900,000. And further assume that in the course of the marriage the parties paid off 400,000 of the debt from marital earnings, so the remaining debt is 500,000. And finally, let's assume that the residence is now worth 2 million. If the principle is to give the house to Party A and give fair compensation to Party B, then we should give Party B half of the couple's equity in the house: (2,000,000 - 500,000) / 2 = 750,000. If Party A made the initial payment alone, then we must first subtract from 2,000,000, and return to Party A, an amount equal to the initial payment plus the opportunity cost of that payment, which could mean (a) a reasonable rate of interest or (b) a rate equal to the appreciation of the residence's value - this is a policy choice, not a self-evident economic one. I'm not sure Article 10 does that. It says that Party B should get a share of the appreciation, but it also seems to say that Party B should get some compensation for her (it's most likely the wife) share of mortgage payments made during the marriage. This seems to me liable to lead to double counting. This is not Prof. Wang's objection (it would work in Party B's favor, in any case). His objection is that this treats what ought to be marital property essentially the same way as property brought into the marriage by either spouse, thus rendering the marital property regime for the residence essentially meaningless. He doesn't quarrel with the economic calculation, but says that Party B is put in a disadvantageous position by having to be the plaintiff in requesting her fair share of the value: she has to pay the legal costs of defending her interests and she has to bear the burden of proof, while Party A can enjoy the benefits of passivity. There is something to this, if the courts choose to deal with the issue that way. I note, though, that the interpretation says that courts "may" (可) treat the residence in this way. I see nothing in the interpretation that would prevent the court from treating the issue of property division together with the issue of compensation - that is, telling Party A that he can get title to the residence provided, and not until, he gives appropriate compensation to Party B.
Prof. Wang makes a good point when he notes that despite the SPC's professed intention of bringing the Marriage Law into line with the Property Law, Article 10 is actually inconsistent with the Property Law's treatment of the division of jointly-owned property. According to Article 100 of the Property Law, where jointly-owned property can't be easily divided, or where doing so would impair the value (clearly conditions that apply to a jointly-owned apartment), it should be sold or auctioned, with the proceeds divided among the joint owners (each of whom could, of course, bid at the auction). This is an easy way of maximizing the value of jointly-owned property in a way that neither party can complain about (assuming they have easy access to credit, which might not be true). Pretty strong stuff. Available in English and Chinese at the China Media Project web site here. He has some good rhetorical touches. Among other things, he notes the irony that the judge in Li Zhuang's first trial, who excused all seven prosecution witnesses (all of whom were in custody) from appearing and being cross-examined because they "were unwilling" (grounds that have no basis in the Criminal Procedure Law), had written his master's thesis in law school on the necessity of witnesses appearing in court.